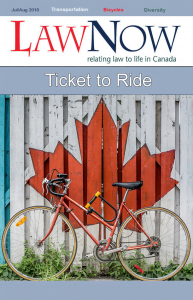 Canadian laws that impact your travel and transport. Cyclists should assume that almost everything that applies to drivers of cars applies to them. Looking at taxes for fuel, license and registration, air travel, Uber and business travel. There is no difference between drunk driving and drunk boating under Canada’sCriminal Code. New federal airline laws will cover bumping, lengthy tarmac waits, flight delays and cancellations. Provincial laws may provide bankruptcy exemption limits for certain vehicles. Four years’ research found that racialized lawyers face a variety of professional barriers to growth. Syrian refugees in Alberta are protected from discrimination as are all Albertans. The work of BearPaw Legal Education is grounded in building individual and family resilience. Looking at the deeper, more meaningful value of diversity in the law.